How will your app integrate with multiple business systems? How can you provide a modern and friendly user interface? How will you ensure it can analyse and report on complex data? How long will it take to acquire the hardware and software to get started? How can you capitalise on the other systems and cloud solutions you already use? Just working through these issues can mean it takes months to get your project off the ground. By then, you may have missed your window of opportunity, or your business needs have changed. 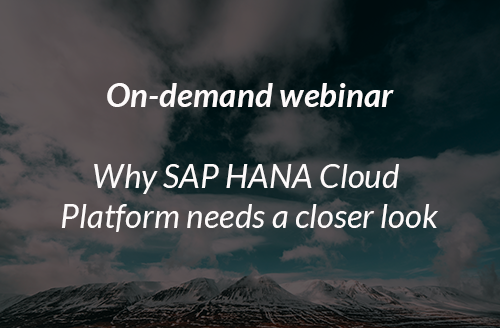 Join Gareth Ryan, HCP expert and SAP mentor in this on-demand webinar to discover that if you’re already running SAP, the HANA Cloud Platform could help you get started a lot more easily and quickly.